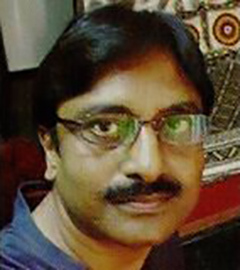 Sanjay Kumar Shrivastav was born 1961 and lives in Mumbai, Maharashtra, India. He has a Masters degree in Fine Arts from Agra University and a Diploma in Fine Arts from Allahabad University. After completing his masters , he joined research on subject concerning mental therepy trough different experiments with the resonance of colour. He wished to find out the various aspects and impacts of colours on mentally retarded children and physical disorders related to the mind of human beings. Solo shows: Shreedharani Art Gallery, New Delhi - 1990,1992, 2007. Jehangir Art Gallery, Mumba - i993, 1995, 1999, 2004, Grindlays (sponsored) Kanpur 1992. Leela Kempenski, organized by the Arts Trust - 1993, 1996 (Mumbai). Galleria Worli, Mumbai - 1997, New Delhi- 2002. Nehru Center - Worli 2000, Mumbai. Organized by Arts Resourse Trust in Hotel Athena, Mumbai - 2001, Organized by Primary Colours, Mumbai - 2002. Organized by PR.9 in Grand Hayat, New Delhi - 2004, Habby Arts - 2005. Museum Art Gallery - 2005, 2008, 2009, Mumbai, SOLO SHOW Sponsored by Vinyasa Art Gallery, Chennai - 2010. Jehangir Art Gallery - 2011, 2014. Group Shows: group shows all over India & abroad since 1987.
important Group Shows - Harmony Show organized by Reliance Group in 1996,1997, 1999, 2001, 2003. RP Group, a show organized by Harsh Goenka in the National Musem, Germany. Art Resource Trust in Singapore and Hong Kong - 2001. A show of Five Artists by Art Celeberation in New York - 2003.